1871 January 1 Riggside Douglas James Swann Alex Gold Collier 27 Miscellaneous Run over by a truck on an engine plane. He was riding on it against orders. 1871 February 23 Chapel Wishaw W S Aitken Andrew Muir Overman 30 In shafts Drawing pumps with an old worn out crane rope; it broke while he was on it. From Main body of report: The pit where this unfortunate occurrence took place had just been sunk, and the deceased and his neighbour had been engaged forming a water lodgement and other preparatory work near to the pit bottom. I understand that on the morning of the accident they had finished a night shift and had signalled to be raised to the surface. As explained by the engineman he was engaged at the boiler fires at the time the signal was given, but a few minutes after he went in to the engine house, and not being aware that the signal was to raise men, he started the engine and after " backing" it raised the cage. The deceased's neighbour, who was at the pit bottom, reports that the signal made was to raise men, and as the ordinary back signal arrangement had not been completed, it was the practice for the engineman, before lifting away the cage, to slightly raise it, and afterwards set it back, which was the acknowledged signal for men to get on to the cage. In this case the deceased and his neighbour when they saw the cage being set back attempted to get on to it, but it was not put back sufficiently, and they did not succeed in getting quite on. The deceased got crushed between the cage and the shaft, but his neighbour escaped by throwing himself back out of the cage. The defect in this case lay in the back signal, and if a right back signal had been in use, in all probability the accident would not have happened. From Main body of report: The deceased was a small contractor at the colliery. He was engaged driving a stone mine off the shaft, and shortly before the accident he had returned to the shaft from it, for the purpose of being raised to the surface. While standing close to the side of the shaft, awaiting the return of the cage, he in some way overbalanced himself and fell to the bottom a distance of 40 feet. 1871 April 15 South Boig N Cumnock Lanemark Coal Co John Penman Boy 14 Explosions Explosion of fire damp. From Main body of report: On the morning of the accident, the fireman in making his examination discovered firedamp in an advanced section of the work at A Fig. 1, and extending a few feet back. He properly kept the workmen out of it, and I understand placed a fence at B so as to prevent any person entering it. The manager who visited the pit shortly after, and when acquainted with the state of the ''heading," directed that the "plane" C should be pushed through without delay upon the "end" D, and the deceased, father and son, were also appointed to construct a trap-door at E to be in readiness, so that when the places C D were connected, the ventilation might be carried direct to the face of the heading at A. As to the cause of the explosion, it seems certain that the deceased either ignited the gas at the fence B or inside of it nearer to the heading. In support of this view the boy's cap was found in the inside of the fence, and as workmen had been passing the point referred to, B, frequently on the morning of the accident with open lights, the inference is that the gas lay beyond the fence, and could only be reached by passing within it. Apparently the range of safety did not extend far beyond the fence. According to the fireman it could not exceed nine yards; under such circumstances it would have been better to supply the deceased with safety lamps to work with, and prohibit persons from passing near to the fence with open lights till after the gas was dislodged. From Main body of report: At Corsel Colliery, near Kilwinning, while a "gang" of labourers were engaged filling up an old shaft, and restoring the surface, part of the woodwork, engine framing, and "barring" fell in, with a quantity of the surrounding stuff, and choked up the mouth of the shaft for about 20 feet. After some delay, and a few unsuccessful attempts to force away the rubbish and clear an opening, a run of water convenient to the pit was diverted from its course and allowed to play upon it. During the experiment two men actually went on to the top of the rubbish immediately over the pit, and with a pinch or rod commenced to partially move the stuff, with the view of aiding the water to force an opening, when it suddenly fell away, and they were hurled into the shaft with it. It is difficult to conceive a more rash and inconsiderate act, than for two men to place themselves upon a body of loose stuff, their only support, suspended in a shaft 50 fathoms deep, and to deliberately exert themselves to force it away. From Main body of report: One man was killed while ascending the shaft, by a piece of loose strata falling from the side of the shaft. An engine had been started underground a few days before, and the exhaust steam ascending the upcast shaft had acted injuriously on the soft strata. The steam is now carried to the surface in pipes. From Main body of report: The deceased was the bottomer, and at the time of the accident he was engaged placing a hutch upon the cage. From some cause, the hutch not being quite on, it was found necessary to draw it back, and the deceased was in the act of pushing it back when, without a signal, the cage was raised, and he was crushed between the cage and the side of the shaft. The usual steps were taken to prosecute the engineman for culpable neglect of duty, but a link in the chain of evidence was found to be wanting after the trial was fixed and witnesses cited, and ultimately the case was abandoned. From Main body of report: This accident, by which three lives were lost, is an exceptional one, and I do not recollect a similar occurrence during my experience. The shaft was sunk by contract, by an intelligent sinker, of considerable experience, and well acquainted with such work. He was in attendance at the pit mouth on the day of the accident, and, according to his own statement, they were at the time engaged connecting a "set" of pump rods in the shaft. The deceased, three sinkers, were lowered in a kettle by the engine to the point where the connexion required to be made, and where a scaffold, suspended from a crane at the surface, was hanging. It appears that they got out of the kettle safely on to the scaffold, and signalled it away. It was raised accordingly, but in passing the muzzle pin, which connected the scaffold to the crane rope, shown on hand sketch, Fig. 2, the iron hoop of the kettle caught the head of the muzzle pin and drew it out, disconnecting the scaffold, which fell away. There was a quantity of water in the shaft, consequently it was some time before the bodies could be recovered; one of the sufferers was the contractor's son. In discussing with the contractor after the accident as to the insecurity of the muzzle pin, it being secured or kept in place by a strip of bucket leather, he explained that he put in the leather for safety, as being less likely to catch their clothes while being raised and > lowered past it than a split iron cutter. Often a mystery exists as to the cause of these uncommon occurrences. In this case, however, there was no difficulty ; the bolt was found at the bottom of the shaft with the leather in it entire. From Main body of report: At Polton Colliery a man was killed by the winding drum getting out of gear, through the engineman neglecting to secure it properly. The engineman was tried for manslaughter and sentenced to one month's imprisonment. 1871 September 4 Calder Bank Baillieston Provanhall Coal Co Robert Hutchison Collier 50 Explosions Explosion of fire damp. 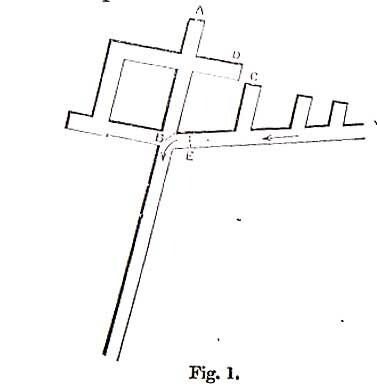 From Main body of report: For 10 months or more previous to the accident a pair of mines were commenced in the main coal seam, for the purpose of communicating with the abandoned workings of an adjoining pit partly filled with water, They had advanced beyond the general face of workings 300 yards, and near to the point of connexion a dislocation of the strata was unexpectedly met with which necessitated some change The deceased were at the time of the accident driving a crosscut stone mine for the purpose of forming a connexion at the proper level, and worked only during day. No one worked within 200 yards of them except a collier, Doran, who was employed in forming a "stow" mine, simply for depositing the stuff produced from their mine. The mine and Doran's place were ventilated by a split from the general current of air. Doran's place and the road leading to it were examined every morning by the fireman. The deceased, Baxter, had a contract for driving the stone mine referred to. He examined it for himself, and was supplied with a safety lamp for that purpose. On Saturday forenoon both places were clear of firedamp; on Monday morning following, about 6.30 a.m., Baxter and his neighbour passed in to their work with their naked lights. They met with firedamp before reaching Doran's room, which ignited at their lights, causing an explosion. Their bodies were found about 50 feet back from the road leading in to Doran's room, which should have been examined by the regular fireman. It came out in evidence after the accident that, in consequence of Doran's place lying so far out of the fireman's way, being distant from any other works, that it was his custom not to make an examination of it until Doran went with him. Unfortunately, Doran did not come out to his work on the morning of the accident, and his place was not examined. If the fireman had examined it he would have discovered the gas which caused the explosion, and in all probability the accident would have been prevented. This is another sad instance of the impropriety of excepting places in a colliery from the surveillance of the general fireman. If it had been the fireman's duty to examine every working part, then Baxter and his neighbour would have waited for his report. But as arranged, practically, their examination commenced at the point leading into Doran's place, where they kept their safety lamp, and outside of which the explosion happened. 1871 September 7 Fernigare Hamilton Archd Russell Rob Feely Collier 15 Explosions Explosion of fire damp at stoops, caused by a roadman putting his naked light to a fall where gas was. From Main body of report: On the 17th September, an explosion of firedamp occurred at Fernigair Colliery, near Hamilton, which burned six persons, one of these fatally. The accident occurred in connexion with some pillar workings where the men worked with safety lamps. One of the roadsmen was working amongst the men with a naked light, which he had placed close to a ''fall" where gas had been seen in the morning. The light lighted the gas and burned the persons near the place. This accident was clearly due to the recklessness of the roadsman in using a naked light where the miners had safety lamps. From Main body of report: On the 18th October there was an explosion of firedamp m the coal workings of the Starlaw Shale pit, near Bathgate. The coal had been newly reached by a stone drift from the shale workings. The air was led into the stone-mine by means of a brick brattice But when the current reached the coal workings it was so much reduced by leakages that there was scarcely a visible current, and firedamp was usually found in some of the workings. On the morning of the accident the fireman of the pit, a bricklayer, were about to put in some additional bratticing in one of the places which contained firedamp. They first sent the deceased in the dark to "waff" it out. In doing so it is supposed that he brought the firedamp in contact with some naked lights about 20 yards distant and it exploded. The man at the face was killed, and five others were burned. There was little firedamp in the workings ; a very ordinary supply of air would have been sufficient to have kept them clear. After the fire in this pit last year, the furnace was removed to the surface, where it is not so effective, and the company are now erecting a fan capable of raising 14,000 cubic feet per minute. 1871 October 30 Bartonholm Kilwinning Eglinton Iron Co Thomas McQuade Fireman 35 Explosions Explosion of fire damp. From Main body of report: The explosion took place on a Monday morning. The ventilating furnace had not been attended to from the preceding Saturday, and I learned that the fireman on discovering the state of the furnace had re-kindled it, and after remaining in the neighbourhood for a few minutes had gone off with a number of workmen, for the purpose, of making an examination of a section of the pit, where fire-damp was supposed to exist. It appears that they proceeded all together, carrying their naked lamps, which ignited a quantity of gas at or within a few feet of the face. Two were killed by the fire or flame, and two died, it is supposed, from the effects of the after damp. At many of the collieries it is the rule for the fireman to examine the mine before the engineman shall allow the workmen to be lowered to their work. An additional precaution has been introduced at Eglinton Ironworks, where the accident referred to happened, by which four persons were killed by an explosion. The fireman, in addition to making his examination before the workmen shall be allowed to enter to their work, is bound to mark with chalk upon each working face the date of his examination. Every colliery owner professes by his special rules to have an examination of his mine made in the morning by a properly qualified fireman. Underground workmen, who trust their lives on the faith of the fireman's examination, are well entitled to ask for every possible security as to the manner in which this important regulation is carried out. And I think the following might be made a special rule at every colliery in this district: "That the fireman, in addition to his examination, shall leave his mark with chalkthe day of the monthupon every working place." There is nothing novel in this; it is a common-sense precaution, and perhaps the best proof that can be obtained of the fireman having performed his duty. No additional expense would be incurred in carrying it out, and if strictly observed it would be productive of much good. From Main body of report: The deceased was a boy about 13 years of age, and was engaged as a drawer in the the "Tourha" seam. He was about to leave off work on the night of the accident, and went with the person who employed him near to the shaft for the purpose of ascending. Being left alone for a few minutes it is supposed that in passing under a screen near to the pit his light had been put out, and in the dark he had unwittingly walked into the shaft and fallen to the bottom, a distance of 32 fathoms. By the special rules of the colliery it was the duty of the manager to appoint a bottomer to make the required signals, and to look after the safety of the workmen while being raised or lowered. Those intrusted with carrying out the details of management wilfully failed to comply with this important regulation. 1871 December 4 Gartshore Kilsyth Wm Baird & Co Neil Harvey Brusher 23 Explosions Explosion of fire damp. From Main body of report: The sufferers in this case were "redsmen," a class of workmen who, at this colliery, where the roof is tender and falls freely, are engaged during the night clearing falls which happen in the roadways, and in securing the roof with wood or otherwise when required. They descend regularly after the colliers' shift ceases. There was a deputed overlooker, and it was his duty to make the necessary examinations for the safety of the workmen engaged under him. On the morning of the accident I understand that he sent the deceased and a neighbouring workman named Tullore to examine the roadways to the west of the main "incline." In the course of their examination they discovered a fall of roof in the west level, and about 120 feet from the face of it. From this point the current of air was guided to the face by brattice, which the fall of roof had apparently damaged; for, when Tullore inconsiderately went in towards the face of the level with his open light, he ignited a quantity of gas, which burned himself and fatally injured his companions. These workmen were not provided with a safety lamp, and it appeared that in their examinations they used no precautionary measures. Under the circumstances the deputed overlooker ought to have examined the roadways with a safety lamp before the ordinary workmen were allowed to travel along them with their open lights. 1871 December 15 Quarter Hamilton Colin Dunlop & Co John Semple Pit-head man 17 Above ground Run over by waggons. From Main body of report: On the 27th December an explosion of firedamp at Mossend Colliery resulted in the death of the underground manager and serious personal injury to the overman. They had gone into a disused part of the workings with their naked lights, and ignited some firedamp which lay there. They were both much burned, and the manager died. This accident was caused by gross negligence on the part of the injured men, who ought to have made the examination with a safety lamp.